I stared at the Facebook notification that said I have been invited to a day-long writing workshop at Zorba the Buddha by Kiran Chaturvedi. I was flummoxed. I knew nothing about the venue and the person inviting me. I was also a little worried. Do I now need writing workshops? I was pretty sure writing came naturally to me. I quickly looked up my blog for reassurance. I had written so many fiction, a few poetry, won some contests – I was momentarily happy. Then I checked the dates of my last few posts with a sinking heart. I also knew that I have been trying to take forward my novel beyond the first few chapters for the last few months. I also wanted to explore a new place and meet new people. So I clicked on the “Going” option. On 12 July 2014, last Saturday, I arrived at the venue at Ghitorni 30 minutes earlier! By now, I had conversed with Kiran, checked out her initiative Write & Beyond and knew about Zorba the Buddha. Something told me I was going to like it. This was my first time inside one of Delhi’s farmhouses and it was such a nice surprise! 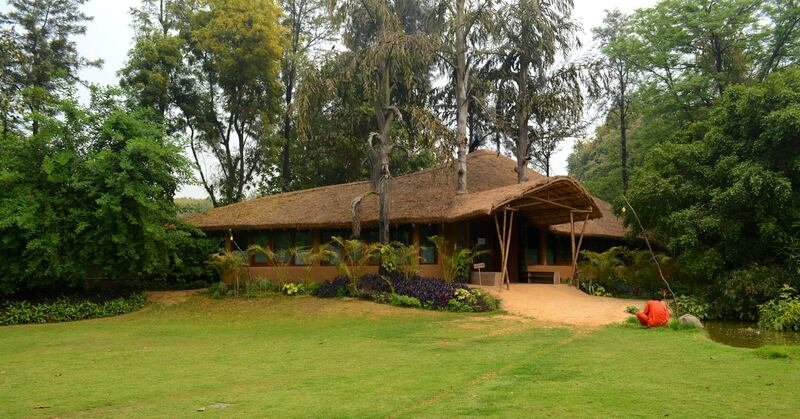 It is an eco-friendly place, with undulating landscape, water bodies and lots of open space. The huge room where we were to have the workshop had mud walls and high ceilings. After a round of tea and cookies, we settled down on the floor cushions and wicker chairs. 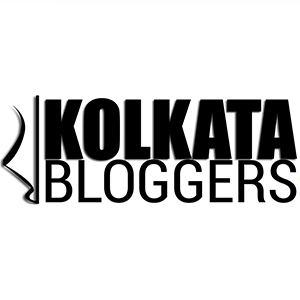 I got myself acquainted with my fellow participants and was kicked to know that there was a strong Calcutta connection among us! Kiran and Kanchana, our guides for the day had both lived in Calcutta for some time while Anupama, a fellow participant grew up in my city and even attended Gokhale College! It was so much happiness for a Cal-starved soul like me. When we came to know Nidhi, another participant was expecting, we passed on hearty congratulations and shared wisdom and naughty jokes at the same breathe! Kiranjit Chaturvedi, a soft-spoken and petite Punjabi (what a lovely oxymoron :)) welcomed us four – Anupama, Nidhi, Avanti and me to the workshop and invited us to take a journey to our innermost being. She informed that unless we connect with ourselves – body and mind – our writing will not flow flawlessly. We closed our eyes, relaxed our whole body and were soon transported to a quiet solitude. The only sound we heard was Kiran’s voice and our breathing! My skepticism at the concept soon vanished. For many days, I have been trying to pen down some short stories for a few contests but have drawn blank. I did not lack time but was unable to grasp at the ideas. I realised that I have not been able to write anything because my mind had been too cluttered with thoughts which I were not letting go of. Once my mind had calmed down, I realised that my fear of not being able to write was unfounded. We were asked to quickly write down whatever came to our mind. Even Kiran and Kanchana joined us. After 15 minutes, we read out our pieces and discussed with each other. I realised Anupama has a flair for beautiful words, Avanti has great clarity of thought and Nidhi has a quirky sense of humour. Kanchana shared something from her novel, a work-in-progress. Kanchana and Kiran engrossed in their writing. Photograph by me. Soon the potato chips were flying off the bowl, peanuts and other munchies vanished into our tummies and a round of wine was offered to us. For Anupama and Nidhi – the teetotalers, nimbu pani and juice came from the organisers. 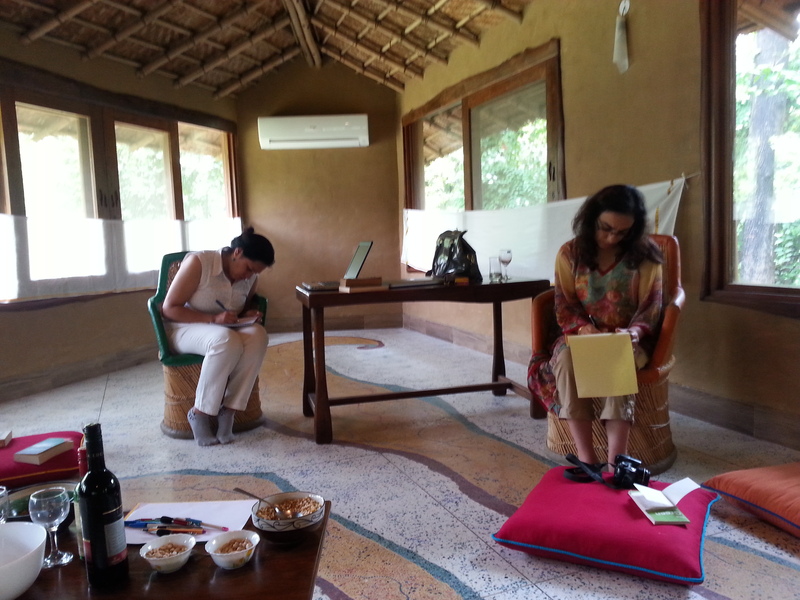 We settled down for a discussion on writing craft, with Kanchana as the leader. Soon we were all participating and contributing our bits. We read from and discussed famous books while talking of opening sentences, narratives and characterisation. We also answered the question “Why we write” to understand how to improve upon what we write. Soon it was time for lunch and we joined many others in the lunch room. The spread of hearty and tasty vegetarian food increased my appetite manifold. 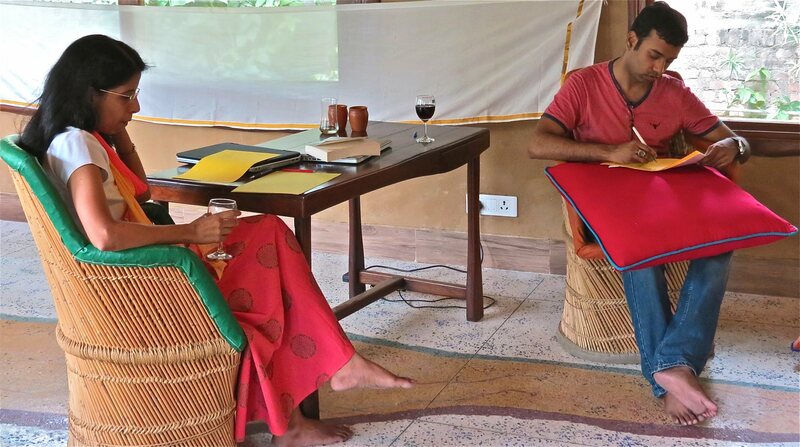 We got talking to Ashwin, the owner of Zorba the Buddha and participants from the workshops on calligraphy and past life regression, which were simultaneously taking place in the venue. 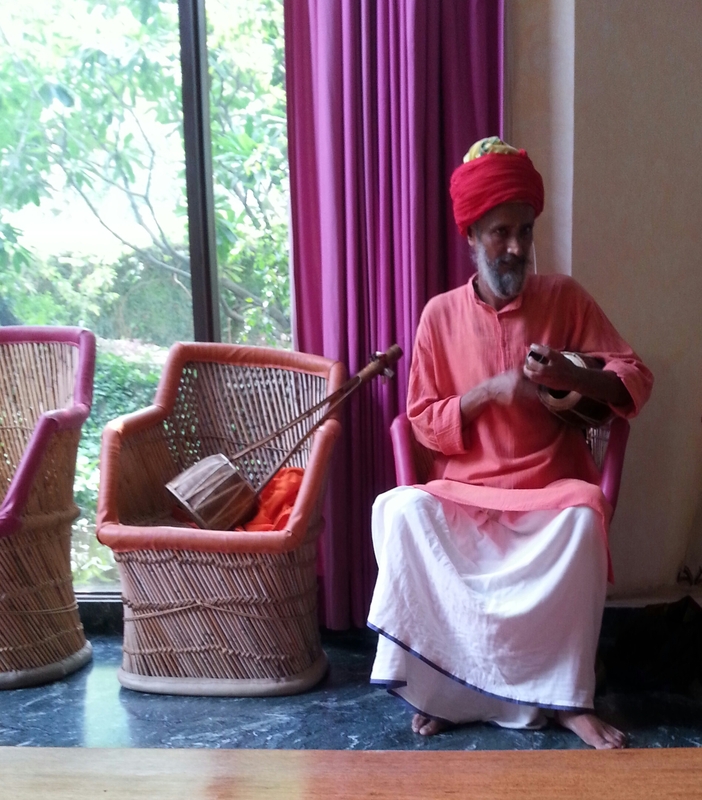 For me, as an additional treat of dessert, a Baul sang in my language to keep us company. Post lunch, we were joined by the mentor authors of the day – Nirupama Subramaniam, the best-selling author of “Keep the Change” and “Intermission” and Satyarth Nayak, author of “The Emperor’s Riddle”. After a helpful discussion on various aspects of writing, Nirupama gave us word prompts to write a less than 700-words piece on the spot! I was in a panic. How was I supposed to write down something new in 30 minutes when I have been struggling to do the same for so many days? Even if I manage to write, what if it was bad? How would I then share it with the others? The mentor authors themselves got down to writing. I closed the incessant chatter of self-doubt in my mind and made myself comfortable with the notebook and pen. I knew that I could incorporate the words into anything that I wrote. So I focused on an idea that has been living with me for many days and scribbled vigorously. Soon, 30 minutes was up and I had 4 pages of written words in front of me. I tried to quickly do some editing but had to give up when Satyarth began sharing his story. We all applauded his piece and then offered some feedback. He was gracious enough to listen to the non-published members of the group too! We heard some beautiful, funny, tragic, quirky pieces from everybody. For everyone, Nirupama and the others had words of encouragement and tips for improvement. When my turn came, I disclaimed heavily saying that my first draft always sucked. I have always been uncomfortable sharing un-edited writing pieces with anybody before since it makes me feel vulnerable! But that day, I boldly shared a short fiction with my new-found writing friends, all of whom only had lovely words for me. A weight from my chest was lifted. The story idea which was residing with me was finally out. We spent the next hour picking the authors’ brains on publishing, editing and the likes. A lot of contacts of literary agents and publishers were passed around. We promised to keep connected through Facebook and Write & Beyond and parted ways 45 minutes past the scheduled end time. I returned happy, satisfied and with a spring in my steps. Thank you Kiran, Kanchana, Nirupama, Satyarth, Anupama, Nidhi and Avanti for all the love, laughter and encouragement. What a wonderful idea! I will love to attend one of these sessions..or something similar. It is always great to connect with like minded souls and I thank the internet relentlessly for giving us that platform. So touched and grateful for your thoughts. Very happy that the experience meant so much to you, as it is something we so passionately believe in and want to spread. Was also our pleasure to have you as a participant, with your beautiful talent, your enthusiastic, open attitude and a strong point of view. A reflection on our writing expression workshop. From Debosmita Nandy, a participant who is an award winning, published author of short stories now working on her first novel. Of course, it is okay to share.